Full-scale field tests were carried out in order to characterise the restitution coefficients of particular geological environments. These coefficients are key parameters of the rock/slope interaction influencing the blocks' trajectory. The blocks were painted and a series of high speed cameras were used to record the fall. Prior to testing, a detailed topographic survey of the slopes was carried out to define precisely the surface morphology and map vertical sections relevant to the trajectories of the mobilized blocks. The results were found to be not in accordance with the literature. In particular, the normal restitution coefficient was consistently found to be in excess of unity and it was checked this result was not imputable to errors in the procedure (see Figure 1). Figure 1: Example of calculations of kn and kt using different frame intervals and visual evidence that the normal velocity post-impact is greater than the normal velocity pre-impact, i.e. kn>1. These unusual results were attributed to the rotational energy of the block, the low impacting angle and possibly the blocks' angularity. The study was resumed in the laboratory, under controlled conditions, to better understand the mechanism leading to kn>1. A launching ramp equipped with a motor was specifically designed to study the influence of rotational speed and block angularity on the restitution coefficients (see Figure 2 a). The results obtained in situ were corroborated by the laboratory study (Figure 2b). Figure 2 a: Photographs of the testing apparatus. 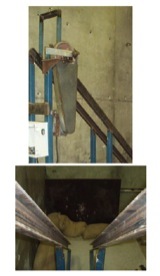 Top: view of the top part of the ramp: spinning device with cover and release mechanism. Bottom: view of the steel channels making the ramp. 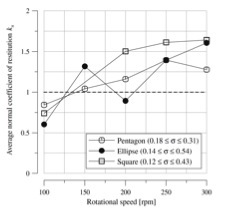 Figure 2 b: Evolution of the average restitution coefficient kn as a function of rotational speed. σ is the standard deviation of three to five measurements. Spadari M., Giacomini A., Buzzi O., Fityus S., Giani GP. (2012) In situ rock fall testing in New South Wales, Australia. International Journal of Rock Mechanics and Mining Science, 49, 84-93. Buzzi O., Giacomini A., Spadari M. (2012). Laboratory investigation on high values of restitution coefficients. Rock Mechanics and Rock Engineering, 45(1), 35-43. 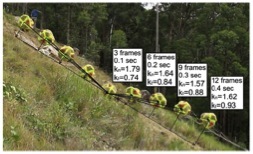 A series of rockfall testing was conducted on a portion of a highwall in a mine of the Hunter Valley, NSW, to assess the efficiency of drapery mesh in reducing block's velocity at the bottom of highwalls. The block's trajectory was recorded via stereo photogrammetry and used to calibrate a numerical model, developed with the discrete element code YADE. The model includes a representation of the highwall (made using sirovision), a double twist drapery laid on the highwall and the falling block in between the two. This model was used to further study the influence of the drapery on the energy levels at impact and the possible optimization of the design. Figure 3: View of the DEM model of the highwall, the drapery-mesh and the falling block in between. The colour provides an indication of the vertical speed of the various elements. Thoeni K., Giacomini A., S.W. Sloan, C. Lambert, D. Casagrande (2011) Numerical analysis of rockfall hazard in open pit coal mines, IACMAG, 2011 Melbourne. Giacomini , Thoeni k., K. E. Kniest, C. Lambert (2011) In situ experiments of rockfall in open pit coal mine, Slope Stability 2011, 18-21 September 2011, Vancouver, Canada. Thoeni K., C. Lambert, A. Giacomini S.W. Sloan (2011) Discrete Modelling of a Rockfall protective system, II International Conference on Particle-based Methods-Fundamentals and Applications, PARTICLES 2011, Barcelona, Spain. A facility has been built indoor to test the performance of rockfall barrier of low energy range (35 kJ). This range corresponds to a large extent of the rockfall hazard in New South Wales. The testing facility uses the principle of the pendulum. An overhead crane is used to swing the block, which is attached to two quick releases: the first one is triggered manually and initiates the swing; the second one, which is triggered by crossing an optical beam, releases the block just before impact on a horizontal trajectory. The barrier is instrumented with load cells and accelerometers to better understand the mechanisms of energy dissipation, from the mesh to the foundations. The so-called "bullet effect" refers to the perforation of a rockfall protection mesh by impact of a small block, which has a kinetic energy lower than the design value, where the design value is determined through tests with relatively large blocks. Although it is a recognized issue among practitioners and academics, there is little data on this phenomenon in the literature. Dimensional analysis was here applied to provide a simple predictive tool for rockfall barrier performance. It is first required to assess whether a function F exists or not in order to validate the formulation of the dimensionless parameters E*, S* and G*. This was achieved using a idealized problem (see Figure 4) made with Abaqus. Validation of the approach was achieved and the robustness of the dimensionless parameters was proved. Figure 4: View of the idealized "Bullet Effect" model made with Abaqus. This dimensional approach led to define the so-called "RoBaP" Model (for Rockfall Barrier Performance). A calibration-prediction exercise was conducted on the numerical data related to a system studied by Cazzani et al (Figure 5b), and the prediction is in relatively good agreement with the numerical results (Figure 5b). One point is clearly abnormal (block of 1m in diameter) which is due to some inaccuracies inherent of this fist validation. Refinement of the model is currently ongoing. Spadari M., Giacomini A., Buzzi O., Hambleton J. (2012). Prediction of the bullet effect for rockfall barriers: a scaling approach. Rock Mechanics and Rock Engineering, 45(2),131-144.